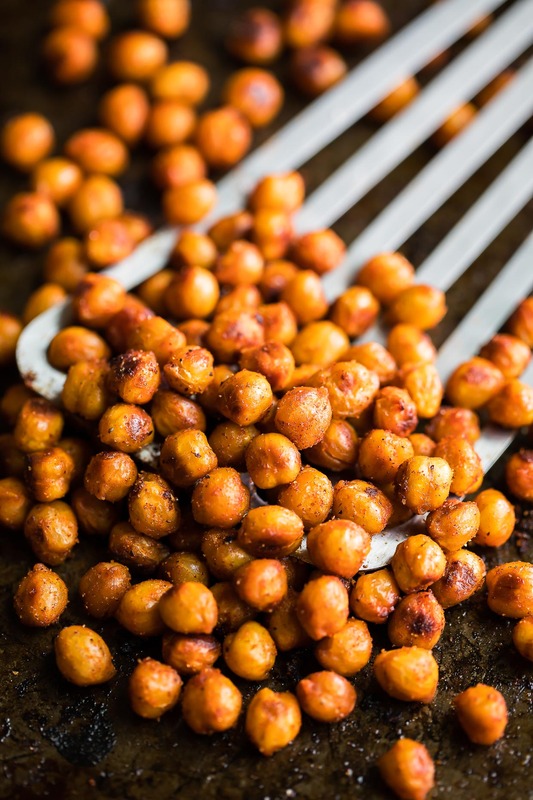 Let a little fire in on the fun with these Sriracha Roasted Chickpeas! They’re great for snacking and taste amazing on top of salads, hummus, and grain bowls too. These tasty little Sriracha roasted chickpeas were totally the answer to my spicy food craving the other day. Once the idea popped in my head I couldn’t shake it. I wanted them. I needed them. I HAD TO HAVE THEM! I’m nothing if nor dramatic. Anywho! These rockin’ roasted chickpeas are slathered in Sriracha, punched up even further with little salt, paprika, and garlic, and ready for snacking! You can devour them by the handful like I tend to do or use them as a fiery topper for salads, hummus, tacos, and grain bowls galore. OMG I feel like they would also be *baller* on top of my creamy tomato soup. <– yeah that is totally happening soon! 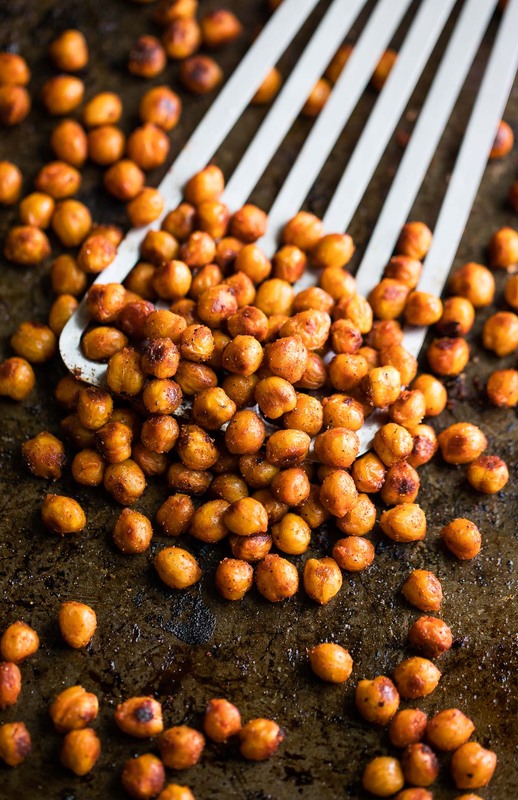 Let a little fire in on the fun with these Sriracha Roasted Chickpeas! They're great for snacking and taste amazing on top of salads, soup, tacos, hummus, and grain bowls. Drain and rinse chickpeas in a strainer, then pour out on a few paper towels to dry. Pat them as needed. In a medium bowl, add Sriracha, avocado oil, and chickpeas. Allow to marinate for 10 minutes. Pour chickpeas out onto your lined baking sheet and spread out evenly so they aren't crowding each other. Bake for 20 minutes, shaking the pan at the 10-minute mark to crisp all sides of the chickpeas. In a small bowl make your spice blend by combining paprika, salt, garlic powder, and black pepper. While hot from the oven, sprinkle seasoning blend over chickpeas and toss well to coat. Transfer to a clean paper towel to cool. Chickpeas will crisp a bit more as they cool. Want even more Sriracha flavor? You can sacrifice a bit of the crunch by tossing the roasted chickpeas back in the bowl you mixed the sriracha in and mixing them up with the little bits of leftover chili sauce. They'll get a bit softer but will still taste great! Want them even spicier? Add 1/8 tsp of ground cayenne pepper to your spice blend! If you get a chance to try these spicy sriracha roasted chickpeas, let me know! Leave some love in the comment form below or tag your photos with @peasandcrayons on Instagram so I can happy dance over your creation! Spicy Sriracha Green Beans <– SO GOOD! Sriracha Glazed Seared Scallops – We made these again yesterday and adoooore them! That moment when you realize your one of your college favorites (Something Corporate + Jack’s Mannequin) is now recording as Andrew McMahon in the Wilderness and you LOVE. IT. ALL. I’m basically in a musical time capsule right now listening to “Space,” “Bruised,” and “Cecilia and the Satellite” on repeat. Is anyone else a fan? My husband pretends to be in agony over my music choices as of late, but I’m pretty sure he secretly adores it! If you need me, I’ll be in an emo-pop coma of my own accord.